In a video interview Pastor Kevin Myers of 12Stone Church unpacks the realization that just one life really matters. With its beginnings as a church plant in the late 1980's, 12Stone(R) Church in Lawrenceville, Ga. (northeast suburban Atlanta), in the early years struggled. But then it became, at times, the fastest growing church in the nation. Today 12Stone is the flagship church of the Wesleyan denomination. It’s hard to keep up with the growth as they recently launched more venues making eight, but their official weekend attendance in 2015-2016 averaged over 17,000. The founding pastor, Kevin Myers, is still the senior pastor. He commented that the bigger they get, the more he is impacted by the realization that just one life really matters. He still gets teary-eyed when one person finds salvation in Jesus Christ or gets baptized. Kevin was a self-described “maverick” from Berkeley Hills Wesleyan Church in Grand Rapids, Mich. He graduated from Indiana Wesleyan University and served for a time on the staff of Kentwood Community Church under Wayne Schmidt (now General Superintendent of The Wesleyan Church) in his home district. When he felt called to plant a new church in Georgia, Wayne and Kentwood Church stood behind him and sent him out. KEVIN MYERS is a great storyteller. In a filmed interview, he unpacked some of the best stories in the history of 12Stone. WESLEYAN LIFE: Tell us about the early days of 12Stone when you almost gave up. KEVIN MYERS: That was when we were the Heinz 57 church. For the first three or four years, no matter what we did, 57 people showed up. The church was not developing the way I had hoped, and I returned to Wayne Schmidt and asked for my old job back at Kentwood. I thought I had failed. IF YOU LACK FAITH, BORROW MINE. But Wayne didn’t see it that way. He made a profound statement that has always stayed with me: “If you lack faith, borrow mine.” He believed we were exactly where God wanted us to be. Sometimes it takes longer than we expect for God’s plan to unfold. Also, I was young and God had been forming me. I had a lot to learn about valuing people, about leaning in and trusting God’s heart, about layering ministry faithfully for the long haul, about prayer. Wayne sensed that I was becoming the pastor God was calling me to be, and he sent me back a second time. WL: What changed after that? KM: We prayed with our core group for three months, and we all felt led to stay in. But God asked me to change the way I pray. Since then, I have never preached on Sunday morning without spending Saturday evening in the church praying. God has showed me that this is a supernatural thing that he is doing, and I give my Saturday nights in prayer. I didn’t ask anyone to pray with me, but some people have. And we have trusted that God will build his church. I’ve done this for 25 years, and it has gotten even more powerful. God is doing some deeper things with us, to trust him even more, and lately hundreds of people have been showing up to pray at the same time. If you ask what changed 12Stone, it was prayer. I HAVE NEVER PREACHED ON SUNDAY MORNING WITHOUT SPENDING SATURDAY EVENING IN THE CHURCH PRAYING. WL: You have a personal mentoring relationship with John Maxwell. How did that happen? KM: At about the ten-year mark of the church, we took a busload of people to a John Maxwell leadership conference in North Carolina. At first it was horrific. The hotel lost our reservations and had to put us in an alternate hotel. But God had something in mind. When we finally arrived at the substitute location, we found it was John Maxwell’s hotel and we met him in the lobby and chatted. But then, in the morning, the person driving him to the conference locked keys in the car, and he was stuck. John hitched a ride to his own conference with us on our bus and we enjoyed some friendly teasing. 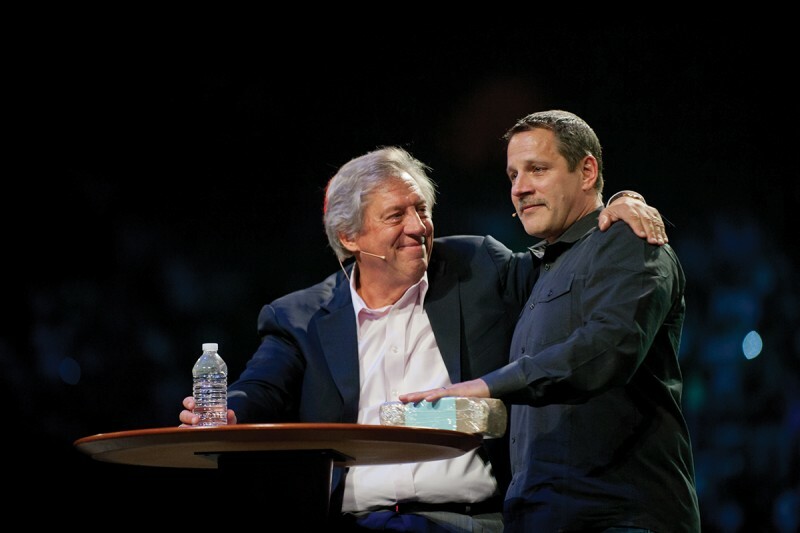 John Maxwell and Kevin Myers at 25th anniversary celebration of 12Stone Church. After the conference, it was unusual for John when he accepted our invitation to eat dinner with our entire group, and he shared some things at our dinner. Before parting, we all stood and joined hands to pray together, and suddenly, the Holy Spirit moved so powerfully that many of us began to weep and we had trouble even speaking. I still get torn up emotionally remembering that moment. Then John said, “Kevin, I think the Holy Spirit has asked me to mentor you.” And John had no idea of the size of that statement in my soul. Years before, when we were at our lowest point, I had asked God to somehow bring John Maxwell to me as my mentor, without me ever requesting it. And that would be the confirmation that the vision that God had given me for 12Stone Church was truly from him. No one else knew about that prayer. It would be difficult to overestimate the importance of that moment in my life and also in the story of 12Stone Church. WL: What are the core ministries at the heart of 12Stone? KM: The ministries that define us will always be tied to three words: lost, least, and leaders. The lost. One person matters. The biblical story of the lost sheep, the lost son, drives us. Every weekend, you could say it is our signature strength that we are highly committed to reaching spiritually lost people. We bring the story of God, contextualized to our culture, we pray, and we prepare for the purpose of connecting people’s hearts to the heart of God. The least. One person, beaten up on the road of life. The story of the Good Samaritan has gotten stuck in our craw, in our souls. One broken person matters. A generosity among our people has exploded into our community. Not just giving generously financially, which they certainly do, but giving of their time, their efforts, and their energies. They stop and make time for that hurting person along the road of life. This probably has done more to mark this church in the minds of people in this community than anything else. We give ourselves away. Leaders. One of the most important things we do in the kingdom of God is raise up ministry leaders, including our new two-year residency program with dozens of next-generation ministers. We raise up and train hundreds of lay leaders for the church, for leadership in the community, among our youth, and at all levels. EVERY ONE MATTERS TO GOD, AND BECAUSE THEY MATTER TO HIM, THEY MATTER TO US. WL: Didn’t you have to cancel your grand opening once? What happened? KM: There are times when God does things that shift the way we see and trust him. When we built what is now our central campus building, we went from a sanctuary holding 1,000 to one that holds 2,500, and we were immediately starting with two services and also launching multiple venues. It was a huge leap of faith, and I’m outwardly very faith-filled, but in this case I had a lot of inner fears. It was the greatest risk we had ever taken. We pulled out all the stops marketing the grand opening in late January, encouraged untold thousands of neighbor invitations, and it was the biggest build-up for the biggest day ever. Then on Saturday it began snowing, in Atlanta. Not just a little snow; it became deep snow and all the churches in Atlanta announced Sunday closings. I stood at the church and looked out at the snow and felt fear and anger overtaking me. We had to cancel the grand opening with all that effort. That night I barely knew Jesus; I was so undone. My prayer of desperation was, “God, I don’t understand you. What is wrong with you? Why are you setting us up for failure?” On our grand opening morning, there were six people in my office. That was all. Then, that week, came the kindness of God. Somehow the story of our cancelled grand opening found its way into the main Atlanta newspaper. Doors opened for the story of 12Stone to stir in the hearts of people, and it multiplied until, when we finally did have our grand opening, more people came than I had dreamed of: over 5,000. As I walked away from the moment, God whispered in my soul, “You ought to trust me. You should know that I have good things for my children and for my kingdom. Even when it’s not clear to you what I am doing, trust me.” That changed me and changed our church. 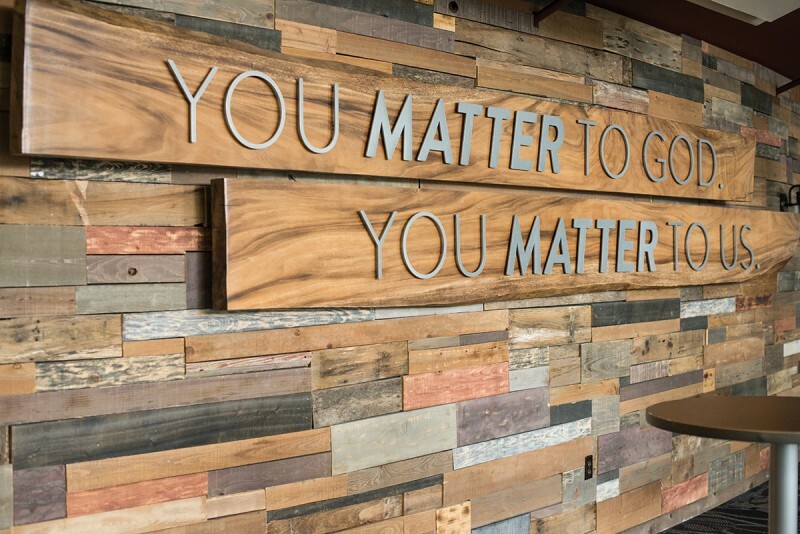 As you enter 12Stone's central campus, a sign reminds each person of their vital importance to God and to the church. WL: Tell us about a moment when God did more than you expected. KM: We felt a prompting one Sunday to do what we called an open baptism. We presented the gospel and explained that even at Pentecost, Peter gave immediate opportunity for the new believers to be baptized [Acts 2:38-41]. Instead of a longer process, we explained baptism fully and were prepared to baptize people immediately who had come to faith and wished to be baptized. I mean right there in the room, take off their shoes, set aside their purse or wallet, and be baptized in their street clothes. In front of everyone, if they were ready to profess Jesus Christ for their salvation and live for him, we would all celebrate with them. We thought it was kind of crazy and didn’t know if anyone would respond in their street clothes, but we prepared just in case. We had some towels and some jogging suits that we were prepared to give people to change into afterwards. The Holy Spirit moved and God totally blew us away. Almost 400 people came to faith in Jesus Christ and were baptized there that day. We had to send runners out to get hundreds more towels and clothes for the additional services when we saw what was happening. IT'S A SPECTACULAR THING WHEN YOU GET OUT OF THE WAY OF WHAT GOD WANTS TO DO AND THEN YOU SEE HIM DO SO MUCH MORE THAN YOU EXPECT. Learning to lead by Jesus' example.